In this version, it will be a full-screen display by the double tap. 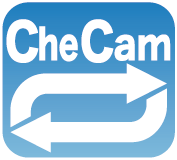 In addition, you will be able to save the recorded video to the Photo Library. This application will automatically continue to play the video that you have taken. Video recording and playback are performed in parallel at the same time. Now adding support for slow motion. For this reason, if you set this application, you can check immediately your form by slow motion video that take automatically during a swing action. To become a good sports player, you should strive to learn the correct form. 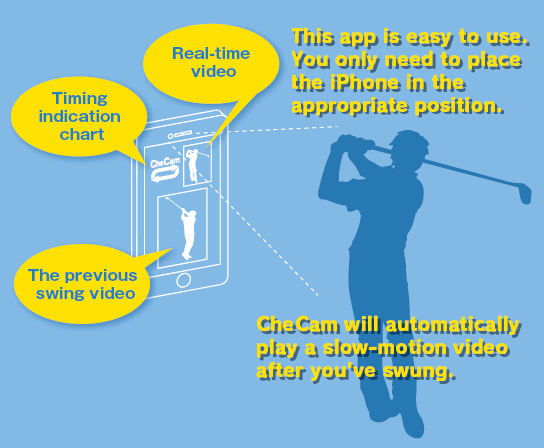 Use the CheCam wisely during practice, to help you improve your swing ! It supports the horizontal and vertical recording. Switching the back camera and a front camera is also available. Taking the video at the maximum 240fps. Run recording and playback at the same time. The vertical and horizontal captured support. You can switch back camera and a front camera. If you want to display the menu bar, please tap the screen. There is a button to operate the start and stop of the recording. And the setting function and the recorded video function are also located there. If you want to play the video in full screen, please double-tap the screen.